This whole exam fever thing does have some upsides. Okay, one - it has one upside. The fact that Indian kids spend so long studying basically guarantees that we top international exams. Asian kids have the highest average SAT score of any demographic, in spite of being one of the largest test-taking demographics. Apparently, studying for your exams does ensure that you do well in your exams. 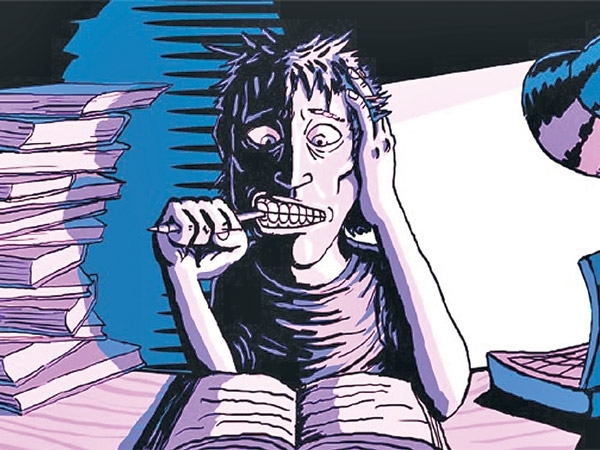 The bad news, though, is... well, for starters, there's the fact that having exams ruins lives. As students, we're expected to shut ourselves in our rooms and spend every second that we're not eating or pooping memorizing our textbooks. Internet connections are cancelled, data plans are suspended and requests to meet friends are denied until the exams finish. You know where else they cancel internet and don't let you see your friends? Prison. Maybe I'm being a little over-the-top here - my brain has been addled by several hours of study a day - but in my experience, nose-to-the-grindstone studying just doesn't work for bringing the roses to the cheeks and the tunes to the lips. Let's say, though, that by some miracle, you survive the tribulations of the exam machine. What then? Well, if you study under most Indian syllabuses, you're probably going to sit in an exam hall and spew what you've memorized over the past three nights of no sleep onto the paper, leave the hall and forget every word of it within an hour. I've never seen a pair of eyes as thoroughly glassed-over as those of a kid leaving an exam hall. The real travesty, though, is once the results come out. The kid who came second's parents yell at him for not coming first. The kid who came first's parents yell at her for scoring 99.8% instead of 99.9%. Then they enroll the kid's sibling into an IIT coaching class, despite the fact that the poor guy can't even reliably spell 'coaching' yet. Personally, I'm all for a smarter population - anything that reduces the membership of the Shiv Sena and RSS are definitely good for the country in my book - but this is a bit much. I love learning, and I love going to school, but even today, I fail to see the need for exams. Perhaps someday, someone will do away with the exams and implement a more long-term, less stressful system of testing. Until then, you're only young once - why not spend some of your youth OUTSIDE a tutor's class? I have read your blog it is very helpful for me.Bookmarked this site.This article is really fantastic and thanks for sharing the valuable post. This is an unprecedented article, I just stumbled upon your blog and wanted to say that I have really enjoyed reading your blog posts. here is such a great amount in this article I would never have considered all alone.I am looking forward on your next post, I’ll attempt to get the hang of it!